Let me Fish Off Cape St. Mary’s is one of the most beloved ballads of Newfoundland and Labrador. It is a hauntingly beautiful song that was written by Otto P. Kelland of Flatrock, Newfoundland in 1947, just before the province decided by referendum to join Canada. See below for the lyrics and a version of the song as recorded by the band Ryan’s Fancy. Here is an excerpt from the new Sgt. 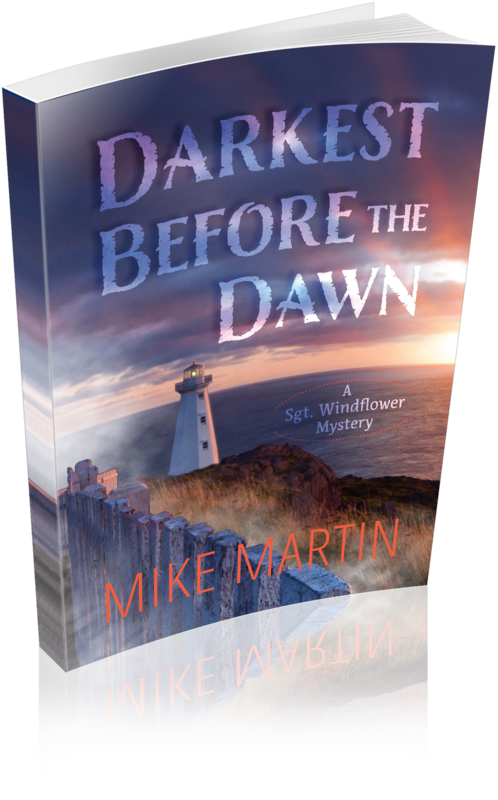 Windflower Mystery, A Twist of Fortune. Windflower and Tizzard took up their position at the bottom of the steps of the Grand Bank United Church. It was nearly half-full and it was only 9:30. The Grand Bank United Church had actually been formed in the early 1800’s when it was named headquarters for the Fortune Bay Methodist Mission. Since those days it had gone through many changes just like the United Church itself, which gathered together many of the diverse elements of Christian Protestants into its fold. The current building was relatively new, but in need of some upkeep and a paint job. Windflower also wished they fix the beautiful, large clock near the steeple. It was permanently stuck at 10 minutes to 1 o’clock, and since Windflower drove by it every day, he’d love to see the correct time. The funeral was about to begin because the dignitaries started arriving. Included, of course, were all the sitting Council members, including Francis Tibbo, who was shaking hands and trolling for votes. 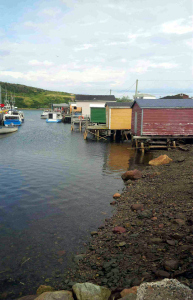 Some of the last arrivals were government officials and the local Members of the Newfoundland House of Assembly who came with the Federal Members of Parliament, in a rare show of community spirit for the two opposing political forces in town. Windflower didn’t see Sheila but assumed she was already inside. Soon afterward, the funeral procession arrived led by Constable Evanchuk with her sirens muted and her red lights flashing. The casket was in the long black hearse and behind it was another black limousine with the six pallbearers: two of his sons, two of his fellow lodge members from the Masons, and two of his neighbours. Behind the two official funeral cars was a long procession of family and close friends, led by the widow, and his three daughters. The family got out of their cars and stood and watched as the casket was carried into the church, saluted on its way by Windflower and Tizzard. They stood at attention as the procession passed and the snow flew around them. When Windflower looked over at Tizzard, he thought he saw a silent tear roll down his cheek. In the words of the presiding minister, the funeral was to be a celebration. Holding true to the family’s wishes, the only tears to be shed this morning should be tears of joy. So even as family members and community leaders and politicians eulogized the departed, they all had a funny story to tell as well. There was music and singing including a choir singing the deceased’s favourite Newfoundland song, Let Me Fish Off Cape St. Mary’s. They may have been tears of joy, but there were very few dry eyes in the church after that. The funeral drew to a close and the casket was led out by the pallbearers and loaded back into the hearse for the interment ceremony at the United Cemetery. Tizzard and Windflower were once again waiting at attention when the family passed, but this time Windflower reached over to shake the widow’s hand and to express his and the RCMP’s condolences on the loss of her husband. Afterwards, Evanchuk led the procession to the cemetery while most of the mourners went over to the Masons Hall for the post-funeral reception. By now the snow had picked up steam and was partnered with a stiff breeze. This was going to be a storm, alright. It was not even a question of when; it was a question of how much snow they were going to get. Let me fish off Cape St Mary’s. ‘Neath the broad Atlantic combers. With my oil skins all a-streamin’.